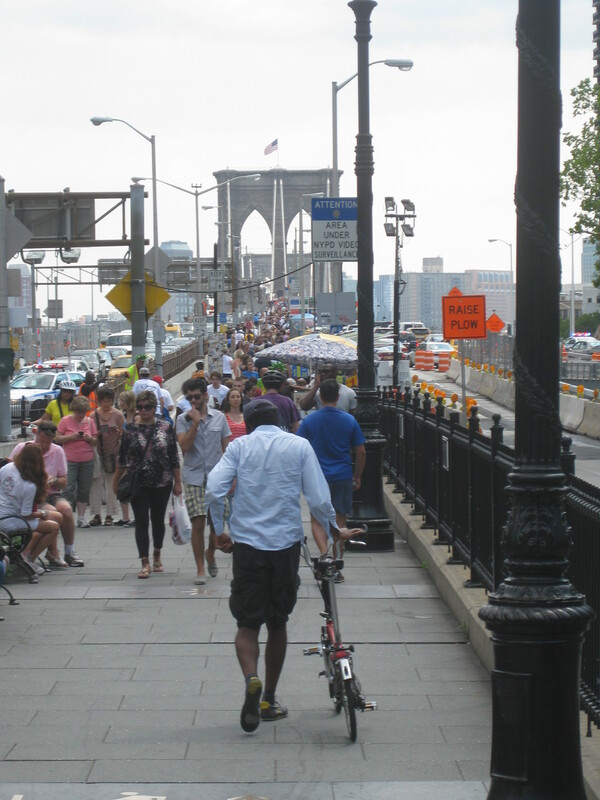 Saturday just gone (August 17th) was the third and final Summer Streets event this year. We only found out about it a couple of days before, having missed the previous two, and were pleased to have made the discovery in time. 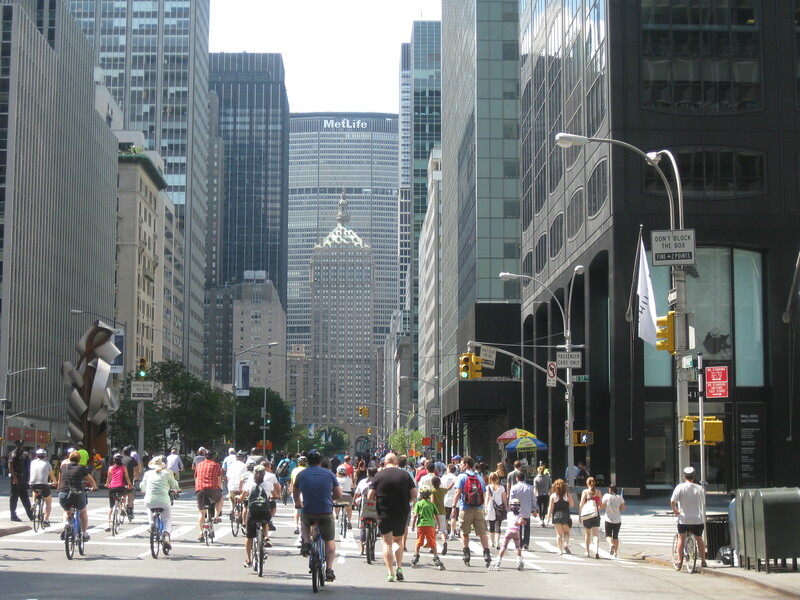 Essentially what happens for Summer Streets is that Park Avenue is closed to traffic (except for at a handful of cross streets) from 73rd Street southwards. After Astor Place Lafayette Street takes up the route, enabling people to walk (or cycle) more-or-less undisturbed by four-wheeled traffic from the Upper East Side all the way to the Brooklyn Bridge. We wandered out at around 10.45 with the vague intention of walking as far as we felt like, and were immediately struck by how much fun it was. We walk down Park early each Sunday morning on the way to church and often have it almost entirely to ourselves, but it was much nicer to share it with a bunch of other pedestrians and cyclists. 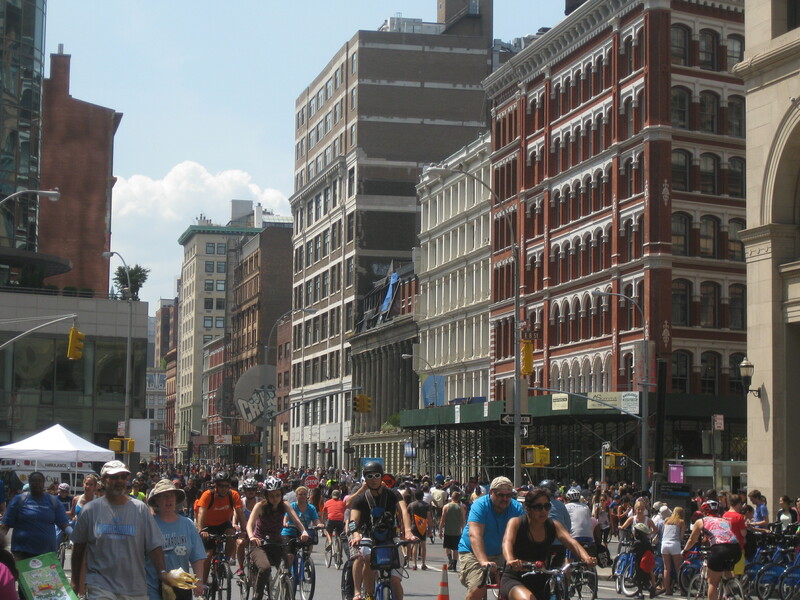 It was actually quite remarkable to see just how many cyclists were out enjoying themselves – New York is way behind many other cities with regard to cycling provision, but there’s clearly a significant appetite for it. 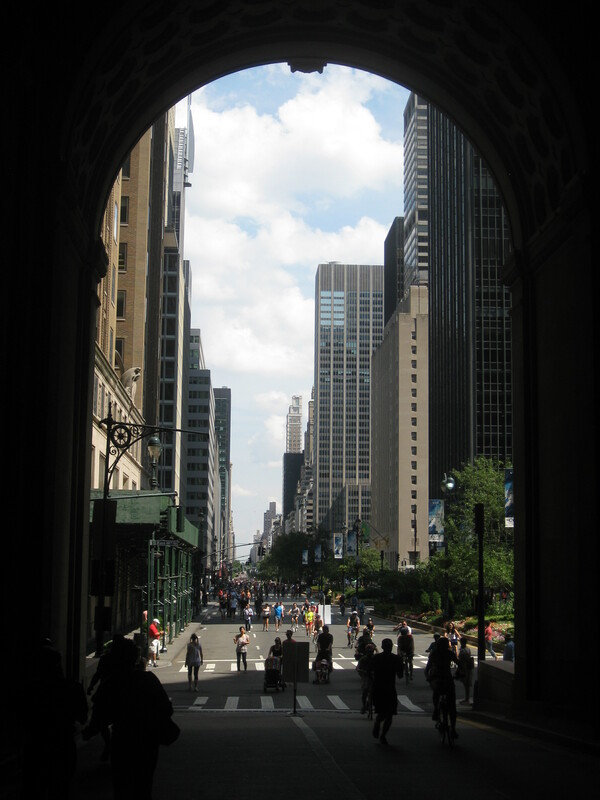 Probably the most interesting section of the route was following the road up through the Helmsley building – usually pedestrians are restricted to a foot tunnel but on this occasion we were able to access the elevated roadway that runs either side of Grand Central station (with great views of the facade, and down 42nd Street). Had we been a bit more organised we might have started in a different place, or got moving earlier – there was an interesting-sounding art installation in the tunnel between 33rd and 40th streets but we arrived too late to get in. Continuing down towards Union Square and then on through SoHo we were reminded again of the range of architectural styles across the city, with a section of lower buildings on either side as the skyscrapers of the Financial District loomed up ahead. We made it through Foley Square just as the end of the event was being announced (the road closures were only in effect from 7am to 1pm), and celebrated our achievement with a quick rest on a bench at the Manhattan end of the Brooklyn Bridge. Given that it was the perfect sort of weather to be outside it seemed silly to just hop on the subway and head home, so we decided it might be fun to have a quick lunch and then walk back along the Hudson river park. Initially this was delightful – we discovered the rather lovely Irish Hunger Memorial, and enjoyed watching watercraft of all shapes and sizes on the river – but after a while it turned into a bit of a trudge, especially given the lack of shade along the path. We were hoping to stop for a shady pint somewhere (or, rather, a pint in the shade!) 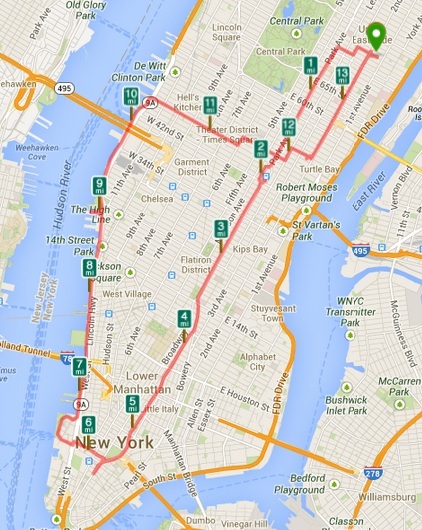 but Chelsea Piers was quite disappointing and the only nice-looking place had a lengthy queue, so we plodded onwards. Consequently it was rather a relief when we were sufficiently far north to head into the cooler canyons of midtown, and we made a beeline for the roof garden of our favourite pub. Arriving home some seven and a half hours after we left it certainly felt like we’d walked a good way, but we were still surprised to learn that we’d travelled 13.6 miles. Not a bad achievement for a lazy Saturday stroll! PS. I took loads of photos along the way, and had more trouble than usual deciding which ones to use in this post. If by any chance these weren’t enough I’ve uploaded a few more to my flickr account, so please do take a look if you’d like to. 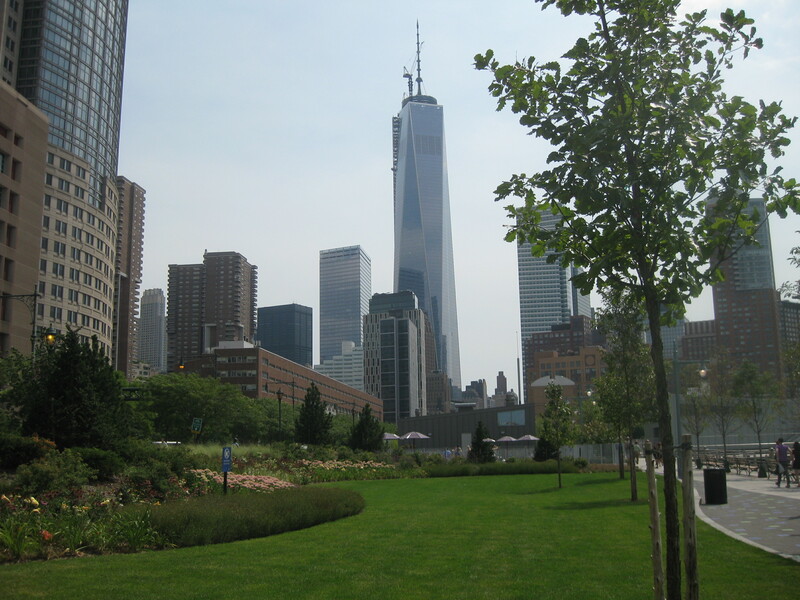 This entry was posted in Exercise, Exploring and tagged Hudson river park, Park Avenue, Summer Streets, walking by Emma Davidson. Bookmark the permalink.